From starting a bus service in Melbourne, APT has come a long way in 85 years, and now has significant holdings in fifteen-ship river operator AMA Waterways and seven-ship small ship operator Noble Caledonia. 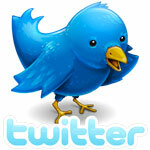 As many will not have heard of them, we have an initial look at who they are. Meanwhile, Costa continues to cannibalize its Spanish subsidiary Iberocruceros by taking another of their ships for its own fleet. Finally, we have a look at what Project Orient’s mooted new Europe-Australia liners will look like. The Caledonian Sky accommodates a maximum of 114 passengers in 57 spacious outside suites, 23 of which have private balconies. Many have walk-in wardrobes and some feature bathtubs, making them deserving of the title luxury. There are two restaurants, a club, small gym, library, clinic, salon and lounge/lecture room across five decks. This vessel has recently arrived in Australian waters not lone after the 85th anniversary of APT, the Australian family-owned business that bought a strategic stake in Noble Caledonia last year. 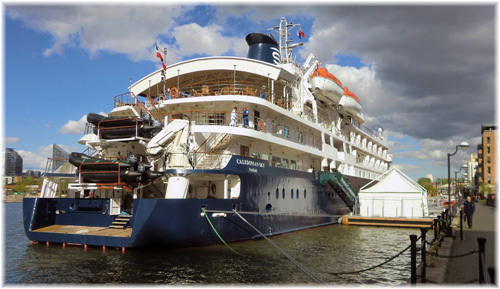 Formed in 1991, APT’s latest interest Noble Caledonia operates river cruises, expedition cruises, small ship cruises and land tours in fifteen world regions, including Antarctica and the Arctic, with seven vessels in its fleet. While it owns two vessels it operates five others on long-term charters, marketing its holidays predominantly in the UK. Meanwhile APT, a family-owned company since its auspicious conception in 1927, and once known as Australia Pacific Touring, and before that as Australia Pacific Coaches, had its beginnings with Bill McGeary. Bill had started by building a bus body on a truck during a tram strike in Melbourne in 1924. Through Bill’s son Geoff, APT then pioneered Australia’s touring industry in the 1960s and 1970s with a diverse range of modes. Over 85 years later, APT Group is a multi-brand business with a global portfolio of touring and cruising products, and still owned and controlled by the McGeary family. APT’s biggest interest in cruising is its interest in AMA Waterways, founded in 2002 by river cruise executives Rudi Schreiner and Jimmy Murphy of Brennan Tours in the US. APT’s investment in AMA dates to 2005, only three years after it was formed. The company offers unique itineraries for a variety of destinations throughout Europe, Asia, and Africa, although the majority of their cruises take place in Europe. With a fleet of fifteen ships carrying an average of 140 passengers each, AMA Waterways introduced all-weather panoramic balcony suites to Europe’s waterway. It had also pioneered full-size French balconies, with 75% of all cabins on board its European fleet having them by 2008. Since that time APT has expanded further, taking a 51% interest in 2009 in GW Travel, now known as Golden Eagle Luxury Trains, operating Russia’s only fully-en suite train, and in 2012 taking its strategic interest in Noble Caledonia. In addition to operating the 114-passenger Caledonian Sky and Island Sky, which are managed by Salen Ship Management of Sweden, Noble Caledonia operates five other small ships on charter on itineraries worldwide, hosting between 50 to 160 passengers each, the most recent of which is the 107-passenger ex-Hurtigruten ship Serenissima. Costa Group has decided to shift the 1,200-berth Grand Mistral from the Iberocruceros fleet to Costa Cruises, where she will take on the new name of Costa NeoRiviera next year. Presumably this will see her refitted in a non-Joe Farcus style, meaning a somewhat more pleasant and less garish on board décor than most Costa ships built along Carnival designs. For some reason, however, sister ship Costa Classica remains in her original form. 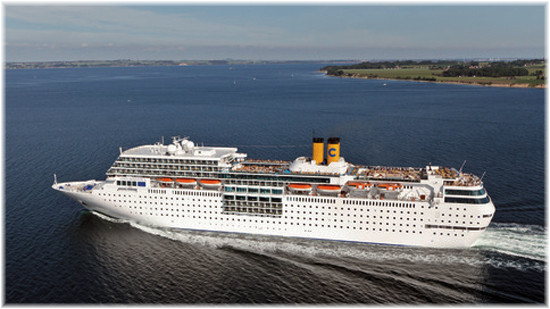 The Costa NeoRomantica will replace the Costa Voyager, herself a former Iberocruceros ship, but no new employment has been announced for the Voyager. Since the Costa NeoRiviera was French-built, one could speculate that if Costa revives once more the Paquet Croisières brand, she might be the right ship. Meanwhile, this leaves Costa’s Spanish brand Iberocruceros with just two ships, both former Carnival vessels, with a total berth capacity of fewer than 3,000. By comparison, Royal Caribbean’s Pullmantur Cruises now numbers five ships with in excess of 9,000 berths, or triple Ibero’s capacity when we include the two ships marketed as Croisères de France. Of the remaining Ibero ships Grand Holiday will stay in the Mediterranean this winter, while the Grand Celebration will be based at Buenos Aires. Costa offices worldwide will now also sell Iberocruceros while Pullmantur’s 2014 English-language brochure, just released, also includes Croisières de France. UK-based Project Orient last week revealed what it thought its two 1,600-berth Europe-Australia ocean liners should look like. The ships would be unlike anything the P&O Orient, Chandris or Sitmar lines, still in business today as P&O Cruises, Celebrity Cruises and Silversea, had ever put on this the route. However, they do design does follow more traditional lines – conventional funnel amidships, tiered decks aft, what appear to be promenades, and a clipper bow and cruiser stern. Project Orient, the promoters, have recently been talking to STX France, who have apparently come up with this rather pleasing profile. Project Orient proposes to route its ships via the Cape of Good Hope or the Panama Canal, depending on the season, but not so far via Suez, probably because of the high-profile pirates who are known to populate nearby waters. When first announced in November last year, Project Orient suggested that fares would start at £2,995 each way and it would take 20 days to reach Fremantle and 25 days to reach Sydney. With the Australian cruise market growing at such a tremendous rate, it could be expected that there would be plenty of locals willing to participate in this revived liner voyage, but others have suggested that the market is not big enough. We will await further news on what could be a rather interesting product. Meanwhile P&O Cruises, Cunard Line and Cruise & Maritime Voyages all continue to offer seasonal Australian departures, southbound in the early winter and northbound in the early spring.